Now the senior custodian for her country 250 kms North East of Alice Springs, Kathleen Ngal shares with her sisters Poly Ngal and Angelina Pwerle - Ngal, responsibility as the keeper of Arlparra’s cultural knowledge. Kathleen belongs to the oldest living generation of Utopia and is among the most accomplished painters who have worked there during the past 20 years. She began her career in late 1979, creating Batiks prior to the introduction of painting on canvas in the late 1980s. Kathleen’s works can be interpreted as sophisticated mind maps depicting cultural knowledge of her country as well as its physical geography. 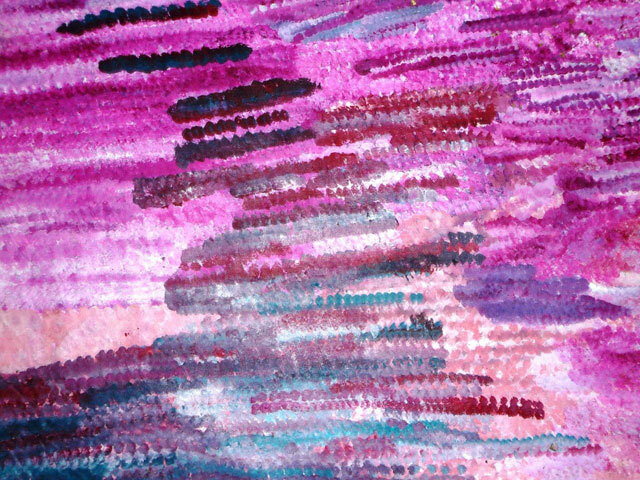 Thousands of dots of colour are rained across her brilliant canvases denoting the varied flora and the geographical and sacred sites of the Bush Plum. Best known for the way in which she depicts the white flowers of the Bush Plum (Artapaly) over a shimmering background of colour, she often employs a variety of blues, purples and reds in her underpainting. Having exhibited nationally and internationally since 1999 she was a finalist in the National Aboriginal and Torres Strait Islander Award for the first time in 2000 and until 2002 her paintings were primarily shown through Indigenart in Perth, Gallery Gabrielle Pizzi and the Hogarth Galleries. While her work can now be seen through a variety of galleries, she is currently represented by Lauraine Diggins Fine art in Melbourne and Coo-ee Aboriginal Art Gallery in Sydney and through these galleries has had regular exhibitions in Australia as well as being shown in ArtParis 2004-2006, October Gallery in London 2005 and Hillside Forum in Tokyo 2008. While her current highest price on the secondary market was the $4,780 achieved for a 121 x 149 cm canvas created for Urapunjta Artists when offered at Bonham's & Goodman Sydney in 2006 this result is backed up by similar solid results at Lawson~Menzies and Sotheby’s. Her works have only recently begun appearing on the secondary market and buyers can expect her prices and her ranking to rise significantly over the years ahead. Kathleen currently lives at Camel Camp in the Utopia region with her husband Motorbike Paddy and daughter Elizabeth Mpetyan, and continues painting with her sisters Poly, Topsy and Angelina. Her works have already been collected by the Art Gallery of South Australia andArt Gallery of WA and are featured in a number of important private collections in the United States of America, Canada, Europe and Australia.